President Barack Obama on Friday honored the memories of those slain in the Warsaw Ghetto uprising against Nazis, telling one elderly man that the memorial was a "reminder of the nightmare" of the Holocaust in which millions of Jews were killed. In the final phase of his European trip, the president greeted Holocaust survivors and leaders of Poland's Jewish community at the Monument to the Ghetto Heroes. He smiled, shook hands and hugged those gathered under a light rain, including some who shared memories of having met Obama at earlier times. "What a wonderful visit. I'll have to bring my daughters," Obama said as he exited the memorial. The monument in the former Jewish ghetto commemorates the tens of thousands of Jews killed in a 1943 uprising against the Nazis during Germany's brutal occupation of Poland during World War II. Most of the insurgents in that uprising were killed, but the event bears great importance in Jewish history as an example of Jews bravely taking up arms, albeit against the odds, to defend themselves against the Nazis. It's also a key memorial in a country that before the Holocaust was home to Europe's largest Jewish community. Among those Obama met was Halina Szpilman, the widow of Wladyslaw Szpilman, the Holocaust survivor featured in Roman Polanski's Oscar-winning film "The Pianist." Obama kissed Szpilman, a retired doctor who lost her husband in 2000, on both cheeks. A leading member of the Jewish community, Monika Krawczyk, was heard urging Obama to do all he can to support Israel, saying: "It's the only Jewish state we have." Obama assured her that the United States would be there for Israel. Obama arrived in Warsaw on a cool and cloudy Friday evening, hoping to inject some vigor into a relationship with an ally that has sometimes felt slighted by Washington. Upon arrival, Obama helped place a wreath at the Tomb of the Unknown Soldier, dedicated to all unidentified soldiers who have given their lives to Poland in past wars. Obama shook hands and chatted warmly with elderly veterans in uniform who had fought Nazi Germany during World War II, including at least one woman. Several of them saluted him. He also greeted younger soldiers and veterans who have served in NATO's mission in Afghanistan. Hours before Obama's arrival, Polish headlines were dominated by news that he was being snubbed by legendary Solidarity founder Lech Walesa, who said he was refusing to meet with Obama. Walesa said in televised remarks that President Bronislaw Komorowski and the US ambassador to Poland had called him hoping to persuade him to meet Obama. Walesa insisted, however, that he had no interest in a meeting that would amount to little more than a photo-op. Walesa refused to divulge more, but it seemed possible he was offended at not being offered a one-on-one meeting with Obama early on. Walesa had been invited to meet with Obama along with other former leaders of the anti-communist movement and current party leaders. Obama will hold two days of political meetings focusing on security, energy and joint US-Polish efforts to promote democracy in North Africa, Belarus and elsewhere in Eastern Europe. 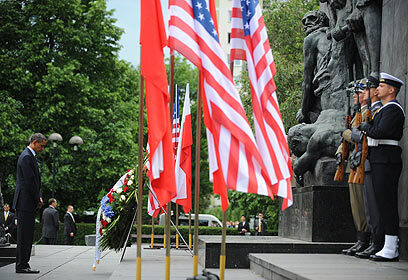 See all talkbacks "Obama lays wreath in Warsaw Ghetto"